Hopefully none of us have had to experience the moment, but the possibility is all too real. A child suddenly starts choking; an elderly parent collapses and goes into cardiac arrest; a neighbor stops breathing... No one should have to witness to such an event - but should the unthinkable occur, the right preparation can save a life. 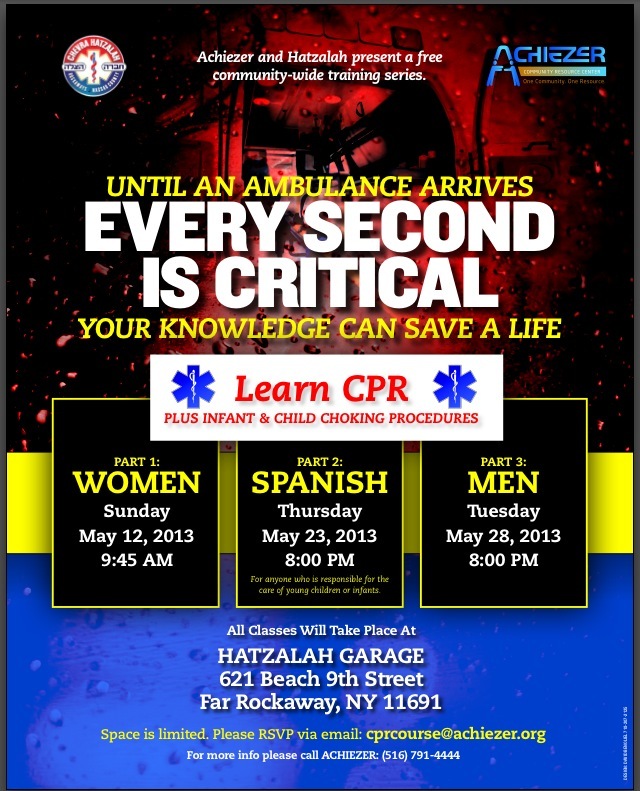 Achiezer and Hatzalah are proud to present a community-wide health initiative, teaching CPR and choking procedures to all members of the community, free of charge. In just one session, you can learn the skills and techniques necessary to make the difference during the crucial few moments before Hatzalah arrives. The program offers separate classes for men and women, as well as a Spanish-language class for the benefit of Hispanic caretakers, who play a critical role in the lives of our loved ones but are often unfamiliar with lifesaving techniques. Don't leave the lives of your loved ones in the hands of someone unprepared to save them. Don't be left standing by helplessly as tragedy unfolds before your very eyes. Sign up for this lifesaving course, today. Due to space constraints an RSVP must be received early to ensure a spot in the class. Please call Achiezer at (516) 791-4444 or email cprcourse@achiezer.org.